So you understand that you need to get in the mobile game – but your next question might be, should I create a mobile site or a mobile app? There are advantages and drawbacks to both solutions, and which would be the better choice depends entirely on the service that you are looking to provide people. Studies have shown that most mobile internet users prefer to use applications for data management, social connectivity and GPS enabled navigation. Mobile sites accessible through browsers are popular for e-shopping, web searches and entertainment oriented tasks. But these are just general trends and the decision either way should be based on the individual merits that each solution has to offer for your unique business needs. There is no need for an extensive and expensive development project since all the HTML coding that is used for a normal website need only be tweaked a little to make it mobile platform ready. It can still retain all of its original functionality. In contrast, app development is tedious and costly. 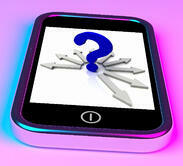 Mobile sites can be accessed universally from any mobile device or tablet. There is no need to purchase or download anything as is needed for an app, and all that is needed is an internet connection. Cross-platform usability is not an issue. Although iPhones, Androids and BlackBerry OS’ differ in some respects, it is a simple task to make the mobile site maintain its utility across the board. All modifications and updates can be done without any need for permission from another organization or a lengthy appeal process. All the usual web analytics tools that can give data on traffic, clicks and user behavior are available as with normal websites. Apps are faster, more user interactive and can be designed to any template or layout. Their functionality is virtually unlimited. While mobile sites are essentially web pages, apps are a separate program that can be made to do whatever it is you wish. The major advantage of apps over mobile sites is that sites require an internet connection to even load, whereas an app will work anytime, anywhere. Once installed on the device, it will always be available for use and the concept of downtime is nonexistent. Apps can be integrated with all the features that the mobile device has to offer. It can access the camera, geo-location services and even the contact list. This allows a large amount of utility that a mobile site cannot offer. The level of performance that an app offers is better than a mobile site, with higher speeds, better quality and graphical interfaces. In a perfect world you would be able to offer both a mobile site and a dedicated app to your customers, but due to time and budget restrictions for many businesses, it often makes sense to focus on one option. Consider all the pros and cons of each and consult a digital marketing expert to help you decide and get started.